I received an advanced readers copy of this book from the publisher in exchange for an honest review. 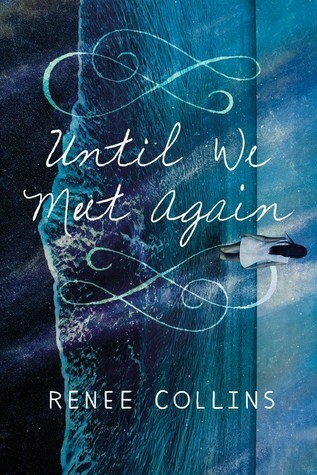 Until We Meet Again is a mysterious and intriguing book about two teenagers living 90 years apart trying to change the past to save each other and their love. This book did not turn out to be how I thought it would be. When I read the synopsis I was expecting this epic love story. I honestly did not see this book as extremely romantic. Yes, there is a romance in it but it almost seems pushed into the background. You also do not get to see many romantic scenes between the two love interests, Cassandra and Lawrence. There are not many kiss scenes and the ones that do exist are not that swoon worthy. There was also no deep and love professing scenes. There was an absence of a falling in love period too, which is one of my favorite parts of a romance. I think Collins let the other plot line block out the romance, sadly. This does not mean I didn't like the book. The way the book went I actually did enjoy. In my opinion a majority of this book would be categorized as a mystery. Cass and Lawrence find out that something terrible is meant to happen to Lawrence that might even end his life. They spend a majority of time doing research in both time periods to try and figure out what happens in order to prevent it. The mystery is why I kept reading because I found it interesting and I was curious to know what was going on. The truth revealed was a great twist and was my favorite part of the book. I did find the book to be slow. I found myself only reading a little bit at a time and it took my a while to finish the whole thing. The pacing was a little slow and it did not seem like a lot happened until the end. The end was my favorite part. It picked up in intrigue and most importantly pace. I also appreciated how she ended the story. I found it much more realistic and honest. Overall I liked Until We Meet Again. I did not dislike it but I did not love it. I think the lack of romance from what I was expecting and the slow reading made it hard for me to fully invest myself in this book.